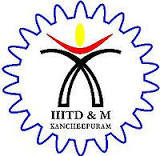 Senior Project Engineer/ Junior Project Engineer job recruitment in Indian Institute of Information Technology Design and Manufacturing Kancheepuram (IIITDM Kancheepuram). Name of Project : Teaching Learning Centre under the Scheme Pandit Madan Mohan Malaviya National Mission on Teachers and Teaching (PMMMNMT) Project. Qualification : M.E/M.Tech/M.Des with minimum 70% of Marks or above. (OR) B.E/B.Tech with two years experience and minimum marks 70% or above.